Why Are You In The Program? These replies are mostly from existing in-service journey level MPA students working for county agencies, social service providers and a few municipalities in and around the Los Angeles region. It is not unusual for some of these students to be in their late 30’s and 40’s. As curious as this all may be, there is something more interesting, i.e., the growing number of “Street Level Bureaucrats” in graduate school. 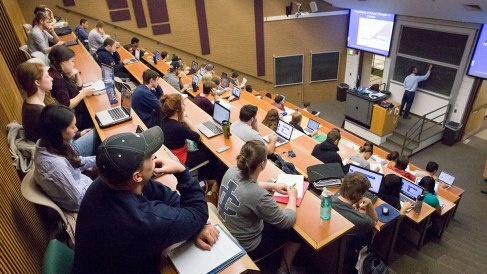 Over the years, I’ve usually had a small contingent in almost every class. What has changed are the increasing numbers. Who Are These Classroom Street Level Bureaucrats? The responsibilities of these positions clearly fall within the categories of Michael Lipsky’s text, Street-Level Bureaucracy–Dilemmas of The Individual In Public Services. Labor agreements, archaic management practices and outdated human resource class and comp requirements set the stage for this wave of new, somewhat reluctant, graduate students. Beyond their own job performance, they have to demonstrate more. Even for long term-seasoned professionals, no new credential means no promotion and no pay raise. They’ve hit the career and compensation ceiling. As a result, some students are very candid about having no choice. The system forced them into the classroom. There is a combination of those that want to be there and those that feel that have to be there. Add into the mix the more traditional, and in many respects less seasoned, MPA student seeking those local government generalist positions and it becomes a complex pedagogical and curricular challenge. Roles, needs, motivations, expectations and aspirations are somewhat different. Do MPA Urban Management Programs Meet the Needs of These Direct Service Providers? It depends. The demand for the customary “Generalist” format still exists as shown by a continuing flow of students that see themselves managing and leading as executives at the municipal and regional levels. Regardless of tradition and the incremental addition of specialized concentrations, existing curriculums may not be structured to meet the needs of all street level bureaucrats. If a program’s primary focus is on the happenings in the executive office, then the answer is clearly no. An initial question might be: Are the traditional offerings pertaining to the inner workings of the city manager’s office, council-manager relations, and public policy analysis germane to the education of these direct service providers? Their needs require immediate, clear, tangible and pragmatic applications. Are Certificates An Adequate Alternative? If this new wave of students is a trend and not an anomaly, then it is apparent that the components of an MPA with an urban management focus needs to be reevaluated. However, are alternatives to the degree, such as specialized post-graduate certificates, more appropriate? If so, will this option meet the needs of both the street level bureaucrat and his/her employer? Should such courses count towards the requirements of the Masters for those that wish to go on? Will public administration programs that deem this need to be valid have the will, time, and resources to make such adjustments? These are questions for each program to assess. For some institutions the need is already apparent.